It’s a BUG eat BUG world, if you want it! For the sake of our kids world we should all practice more ecologically friendly control of garden pests. Below I suggest proven ways to control pests and help the environment. I know these methods work because I use them every day in my work as a pest controller. One of the biggest threats to plants are slugs, snails and aphids. Last summer I was asked to save a garden that had been decimated by slugs and snails. Nearly all the beautiful Hostas had been eaten. In the vegetable garden the early planting of brassicas had been attacked. The lady who was previously very proud of her garden was now at her wits end. She had tried using slug pellets, she followed the directions, "more or less" but still the problem continued. I convinced the lady gardener to follow a green route to slug and snail control. Firstly I looked at her garden, which was on a slightly sloping hill side, damp in one corner. There were all the usual planting arrangements with borders, lawns and tubs and on the far side a vegetable plot. I started by positioning 2 frog and toad houses near the damp area, this not only gives the frogs and toads somewhere to go and cool down during summer but also is a refuge in winter. As we all know frogs and toads love to eat slugs and snails, I sometimes wonder what happens to them if they eat a slug that has been dining on slugs pellets? But I suppose we all know. Owen has tried each of them personally and they work. The frogs will travel a reasonable distance to take slugs so the houses don�t have to be in the middle of the borders. We also administered a couple of watering cans of Nematodes. These parasitic nematodes are supplied in granule form, they are mixed in the watering can and applied to the garden. 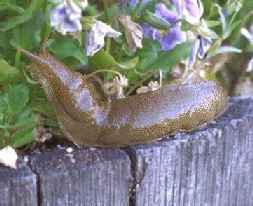 The Nematode burrows into the slug at the hump or saddle on the slugs back and because the slug normally dies underground there is no slimy mess to be seen. The Nematode works when the soil reaches a temperature of 5�C/41�F and it's damp. Twelve million Nematodes is a suitable number for up to 40 Sq metres which is the size of the average garden. Once watered in they get to work and last for six to eight weeks. I find that after that time most plants have become established and are capable of withstanding an attack and even then there is reduced activity. Normally an application twice a year would be sufficient for most gardens. One of the main reasons for using Nematodes as a control method is the elimination of secondary poisoning to other wildlife, and this can include your own pets. Where I live in Airedale there are lots of Mistle thrushes and Blackbirds at the moment who love slugs and snails so I won�t take a chance on harming such beautiful birds by using chemical based control. Remember the other slug predator we should encourage is the hedgehog. Positioning a hedgehog home in your garden will keep the hedgehog in your garden, I find we have a hedgehog that has become a family friend especially with my small grandson who has named it - hmm nice name - Herbert ? 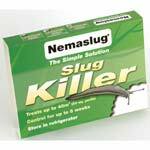 Nematodes can be used to control all manner of pests, Leatherjackets, Chafer grub, Ants, Vine Weevil and caterpillars so there is no need for the toxins to leave the back of the shed! In the green house we have established a colony of Ladybirds to control the aphids, with a ladybird-insect house on the wall they have a safe haven to return too. Remember there are ways to control most pests without the use of chemicals, possibly pesticides might have a place in large scale food production but we need to find alternatives where ever and whenever possible. I can control most mammals and insects with eco friendly methods, I admit in some cases I do have to resort to the use of chemicals, when I do this I use the minimum to achieve a satisfactory result.